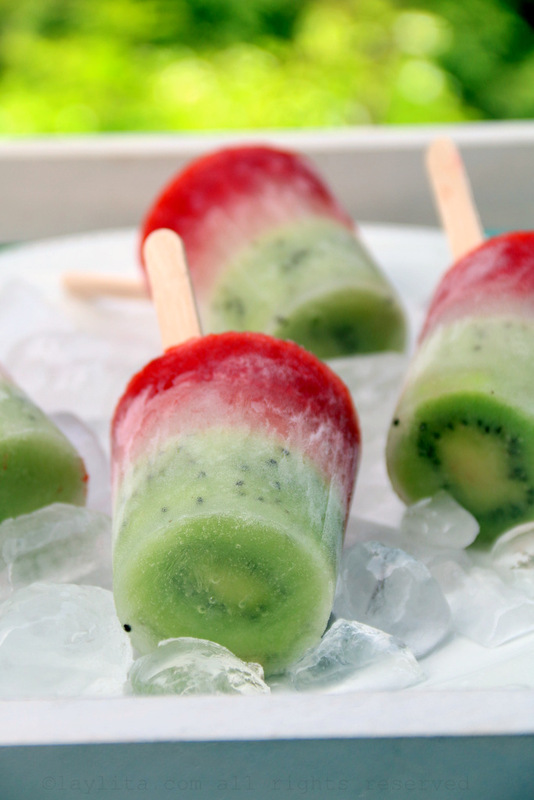 This recipe for Mexican flag paletas or popsicles is made with fruity layers of kiwi, lime, and strawberry. 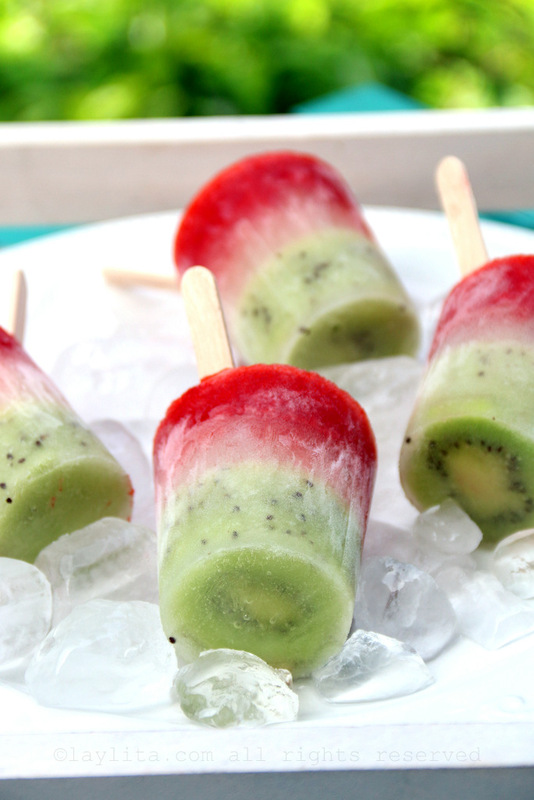 These fruity layered popsicles are easy to make and perfect for these hot summer days. 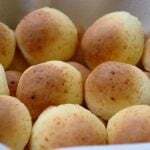 They are also a great treat to enjoy while watching the World Cup soccer matches, especially if you are supporting Mexico. The flavors of each layer can also be customized and adjusted based on your personal preferences and the fruits/ingredients you have available. 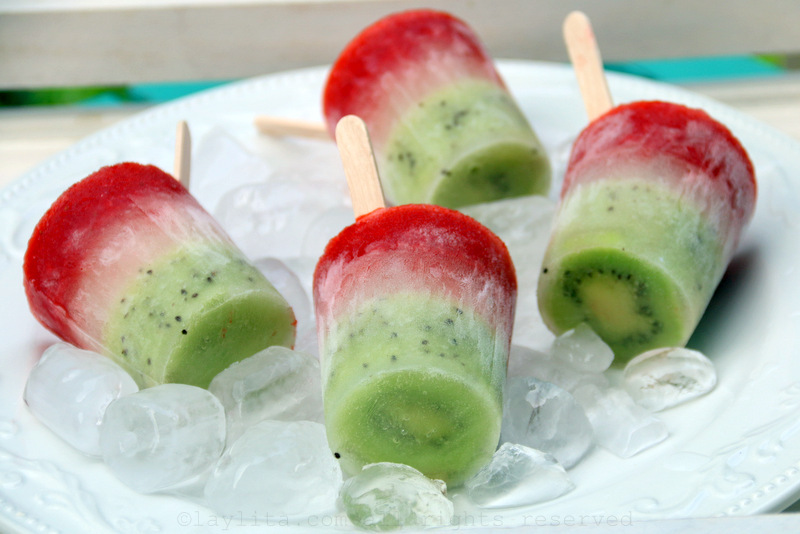 Recipe for fruity green, white, and red Mexican flag paletas or popsicles made with layers of kiwi, lime, and strawberry. 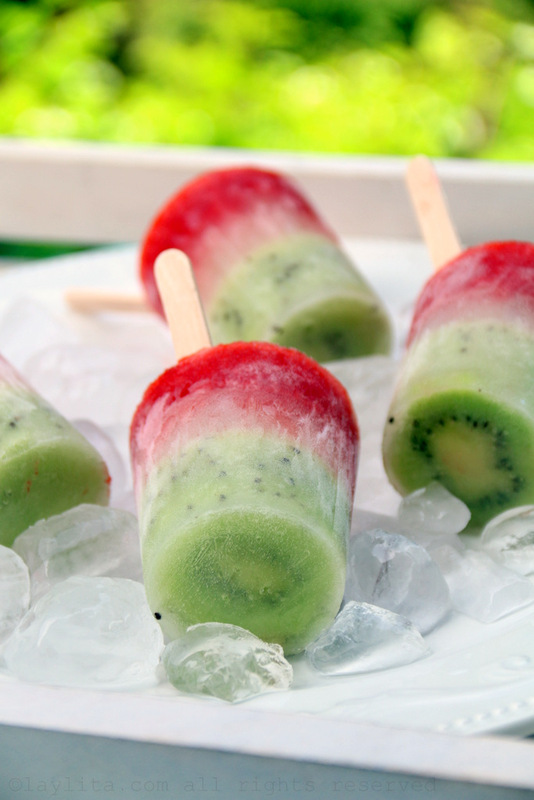 You will need to prepare each color or flavor separately and wait until each one is almost frozen before adding the next layer. 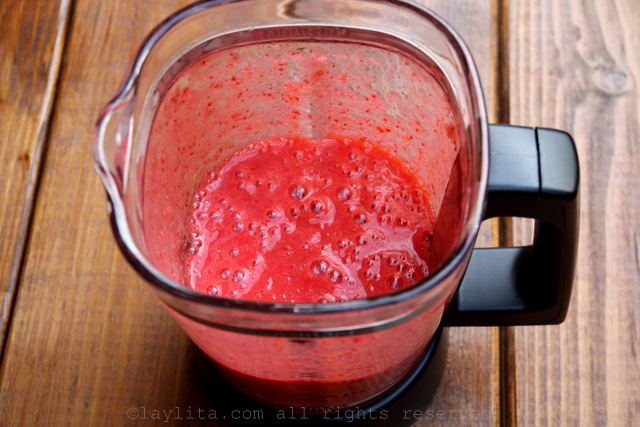 I recommend blending each fruit mix or juice right before you freeze that layer to make sure the flavor is a fresh as possible. I also use a thin baking sheet (that will fit in my freeze) to place the molds or cups on, it makes it easier to move them in and out of the freezer when adding each additional layer. 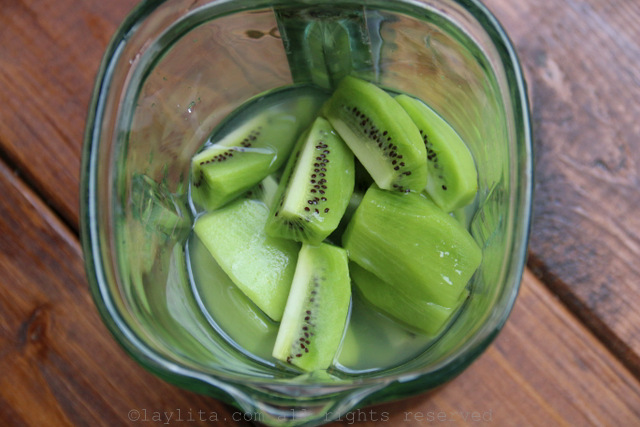 Blend the kiwi pieces (except the thin slices) with the sugar or honey, lime juice and water. Blend until smooth, taste and adjust the sweetness based on your preference. 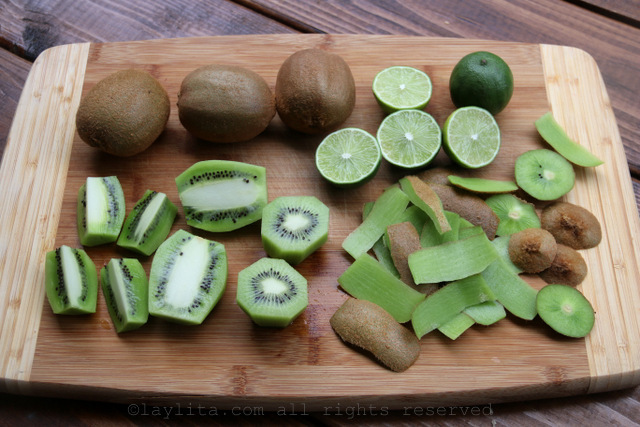 Put a thin slice of kiwi on the bottom of each mold or cup (if using the round molds or on the sides if using the long rectangle molds), and pour the kiwi puree into each mold until it’s about 1/3 full. If you do not mind that the popsicle sticks have a slight tilt then you can add them at this time. 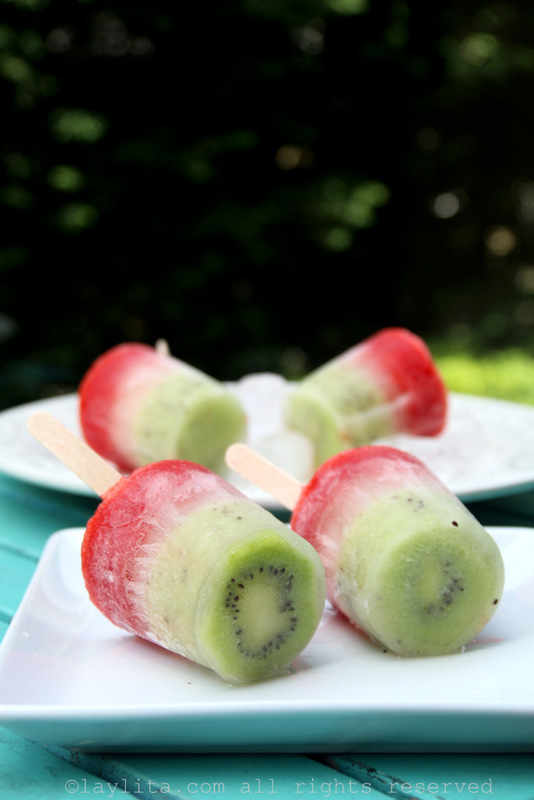 Otherwise, put the molds in the freezer and once the kiwi layer begins to solidify, you can place the popsicle sticks in the center of each cup or mold. As soon as the first layer is almost frozen, prepare the second (lime) layer. 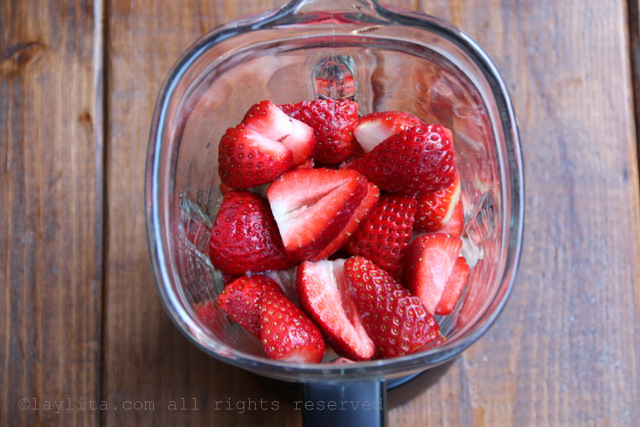 Combine the lime juice, water and sugar in a blender and mix well. Another option is to make a simple syrup with the sugar and the water ahead of time, let it cool down and add the freshly squeezed lime juice. 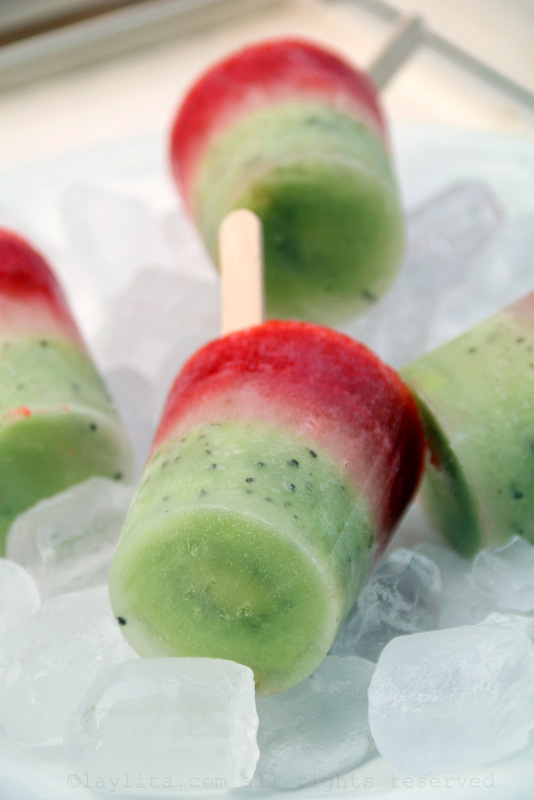 Add the lime juice layer to the popsicle molds until the mold is 2/3 full. Return the popsicles molds to the freezer until this layer is almost frozen. 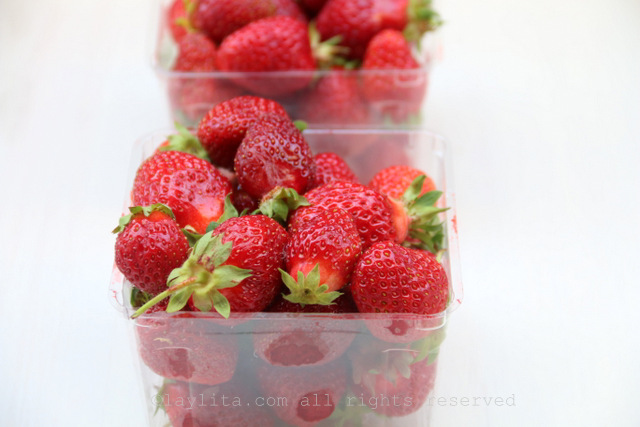 Blend the strawberries with the sugar, lime juice, and water until you have a smooth puree. Pour the puree into the molds and fill them until almost full. 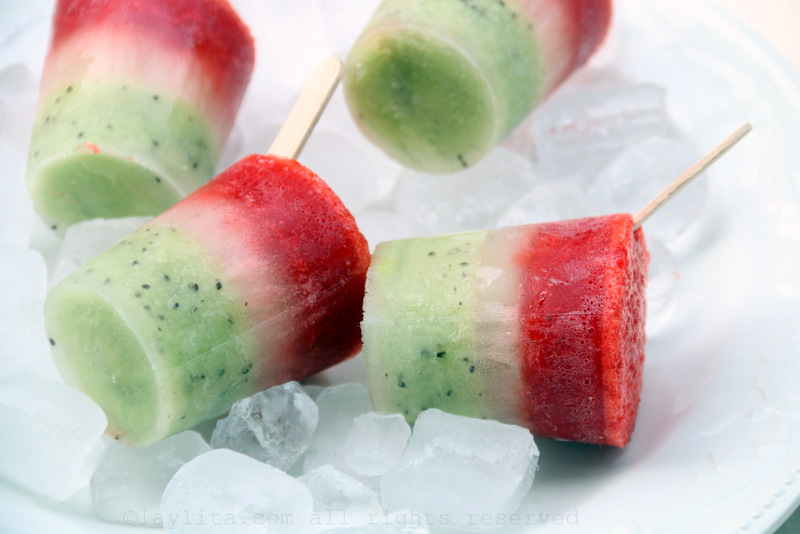 Return the popsicles to the freezer and let them freeze completely, about 4 hours (more or less depending on your freezer). To remove the popsicles from the molds, run the mold part under water for a few seconds and gently twist the popsicle stick while pulling the popsicle out of the mold. If using paper cups, simply peel the cups off. 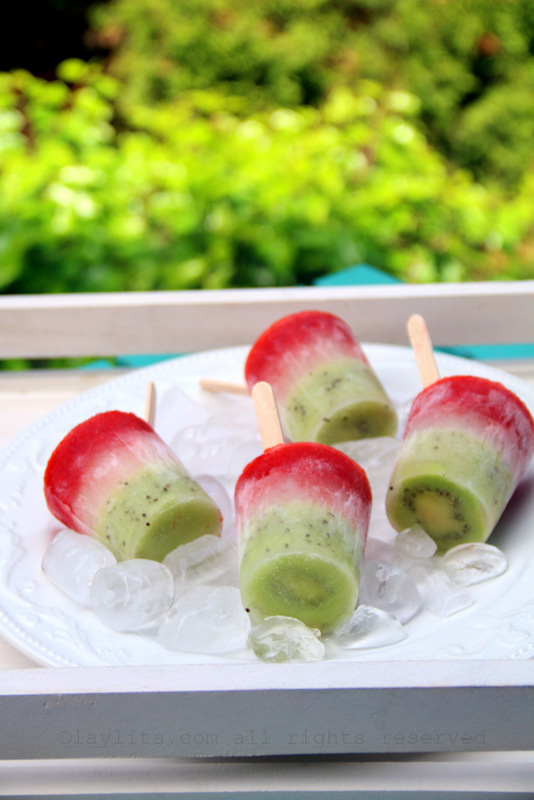 I used kiwi for the green layer of the popsicles, however you could also use green honeydew melon, green prickly pears, green grapes, or even try less common flavors like avocado or cucumber. I used lime for the white layer, it becomes white-ish when it’s frozen. My kids love lime (or lemon) paletas or popsicles, and they like it quite concentrated (ie very sour), so I used a decent amount of limes for the lime layer. 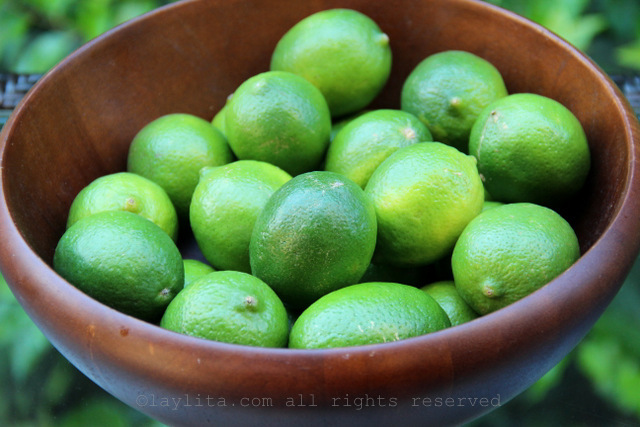 Given that limes are quite expensive now, an alternative could be to make my quick blender limonada or limeade recipe that yields ~2 liters of limeade with only 2 limes – the only thing is that it will have a slightly bitter flavor due blending the entire lime. 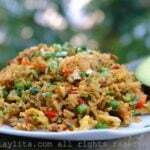 Or you can also use store bought limeade. 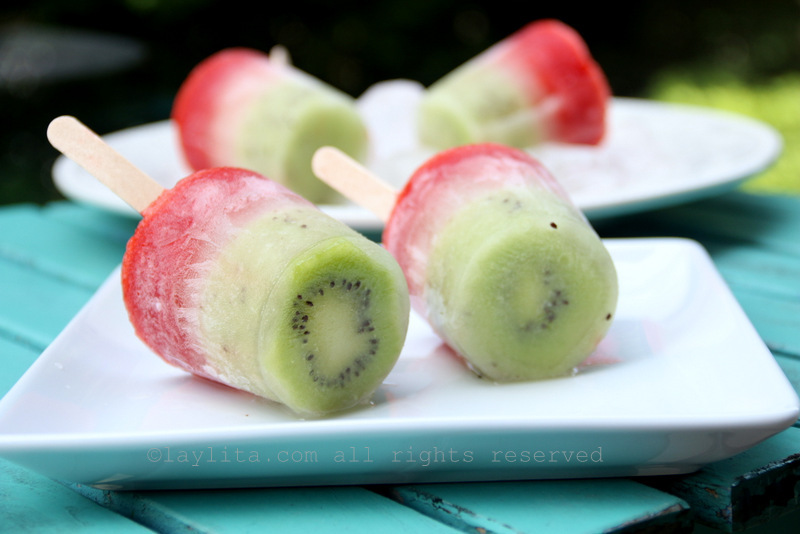 Other fruit ideas for the white layer include white honeydew melon, guanabana or soursop, cherimoya, coconut. You can also make the white layer using flavors like cinnamon milk, creamy vanilla, or even yogurt. For the red layer, I used strawberry puree, other options are watermelon, raspberries or cherries. If you’re running short on time, you can take the shortcut route with any of the layers and use store-bought fruit juices instead of the fresh fruit purees – however, given all the delicious summer fruit available it’s worth it to go the fresh from scratch route. 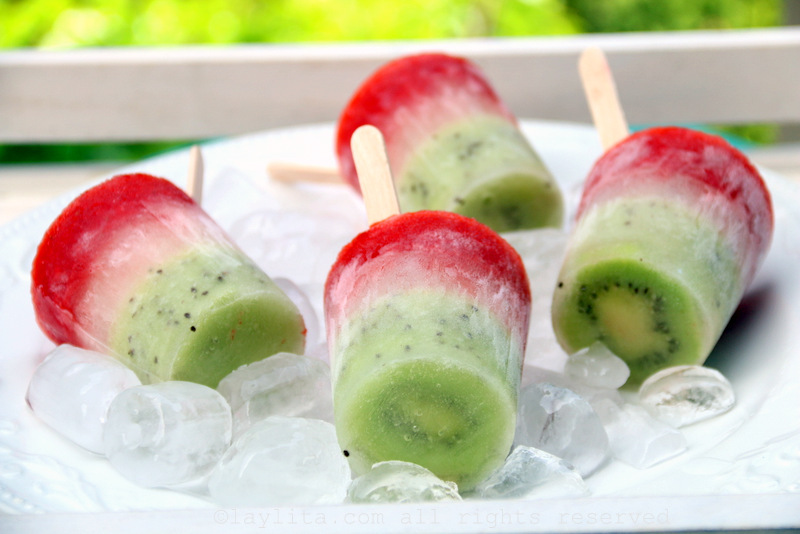 These Mexican flag paletas or popsicles can be made using any regular popsicles molds you have, or you can also use small paper or plastic cups. 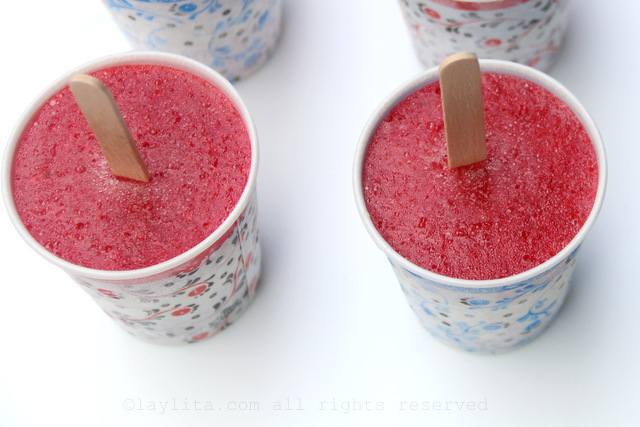 I used 5 oz paper (dixie style) cups, it’s very easy to remove the popsicles since you just have to peel off the paper.